This post is about a Dark Knight collectable item I'm looking for. I'm not completely sure if it fits the guidelines of here. So if this post isn't quite proper for this forum let me know. Also, just to be clear, I'm not looking for stubs from The Dark Knight Rises, and certainly not looking for anything that's connected to the tragedy that happened in Aurora. I only mention it because results from those things seem to clog every search I make for a 2008 stub. I'd be interested in purchasing one from a member of this forum if anyone has one they'd be willing to part with. I'd send an agreed upon payment to you via PayPal. Or if somebody here might be able to point me in the direction of someone who might have one to sell, It would be much appreciated. Last edited by solkap on January 5th, 2018, 2:28 am, edited 1 time in total. I have a couple. How much you willin' to pay, bub?! How about $6? If you'd be willing to agree to that, please PM me. When you do, please send me the email you would want me to use to send a PayPal payment and I will let you know what PayPal account from which you can expect payment and the address to which you should mail the ticket stub. I'm finally getting around to bumping this thread. 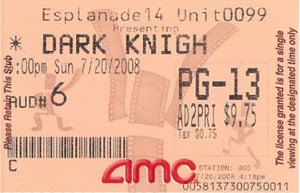 I'm still looking for a ticket stub from a 2008 showing of "The Dark Knight". The offer from user "AsianVersionOfET" above didn't pan out because they realized they only had one stub and did not want to let it go. Does anyone on this forum have something like this that they would be willing to sell me? I'd send you my mailing address and I'd pay you with Paypal. We can haggle a bit on price. Please let me know if anyone has one of these tickets, or know of any leads I might use to track one down. Last edited by solkap on January 5th, 2018, 2:27 am, edited 1 time in total. Bumping this thread. Still interested in a 2008 Dark Knight ticket stub if anyone has one. Believe it or not, I'm still holding out hope that I can find someone who still has a ticket stub from a 2008 showing of TDK that they would be willing to sell to me. I've posted here before, but nothing has panned out. Hope kinda fades with passing time, so I'd be willing to raise my payment offer pretty substantially from what I've posted before. Again, I'd be looking for a non-IMAX stub. Please let me know if you have one you'd be willing to sell, or an idea of somewhere else I might post a wanted ad that would put me in touch with a seller. I'm just looking for sentimental reasons.